One of our new hand-painted signs. It’s been a long old journey. For over 34 years I worked at Toye & Co, one of the oldest, family-run, manufacturers in the JQ and for most of that time my desk overlooked the cemetery. Not that I could see out of the windows, which were reeded glass. This will be familiar to everyone who knows the Coffin Works, you don’t want the workers distracted! I first learnt of the Coffin Works when I watched the 2003 BBC2 Restoration programme with Griff Rhys Jones, a competition where viewers voted for their favourite building to win funding for its restoration. 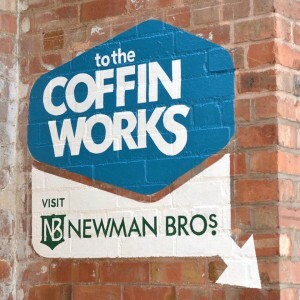 The Newman Brothers Coffin Works was my favourite. I’d never heard of it before but I’ve always loved a Marie Celeste story and it was in the Jewellery Quarter. Left behind were boxes and boxes full of metal stuff – crucifixes, handles, ornaments etc. And shrouds. SHROUDS. I never knew! It didn’t win the regional heat and the overall winner was the Victoria Baths in Manchester. OK the baths were rather lovely and I remember they had stained glass windows and some nice tiles, but they weren’t in the JQ. And they didn’t have shrouds. I heard little more until, in January 2013, Simon contacted the Birmingham Civic Society, where I was Chairman. He had just taken over as Director of BCT and so I invited him and Suzanne to Toye so that they could see how the equipment, dies and tools left behind at the Coffin Works are still in use today. The cast-iron gates welcome visitors (and me!) 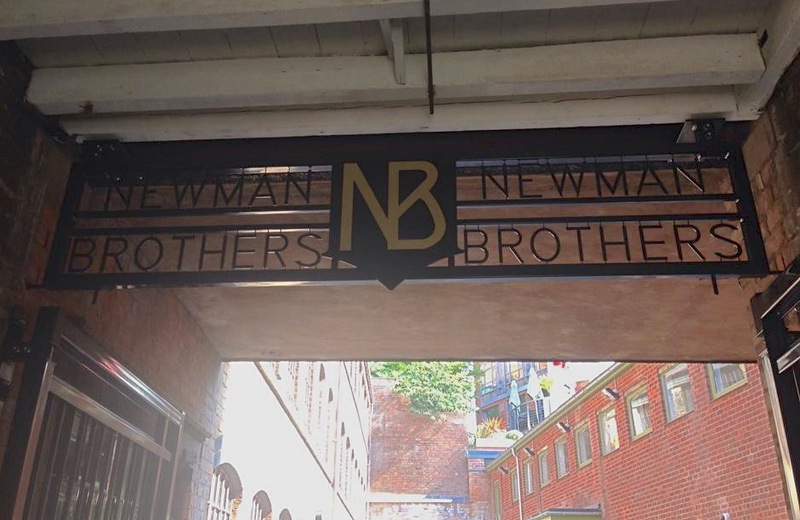 to Newman Brothers, leading into the historic premises of the grade-II* listed factory. 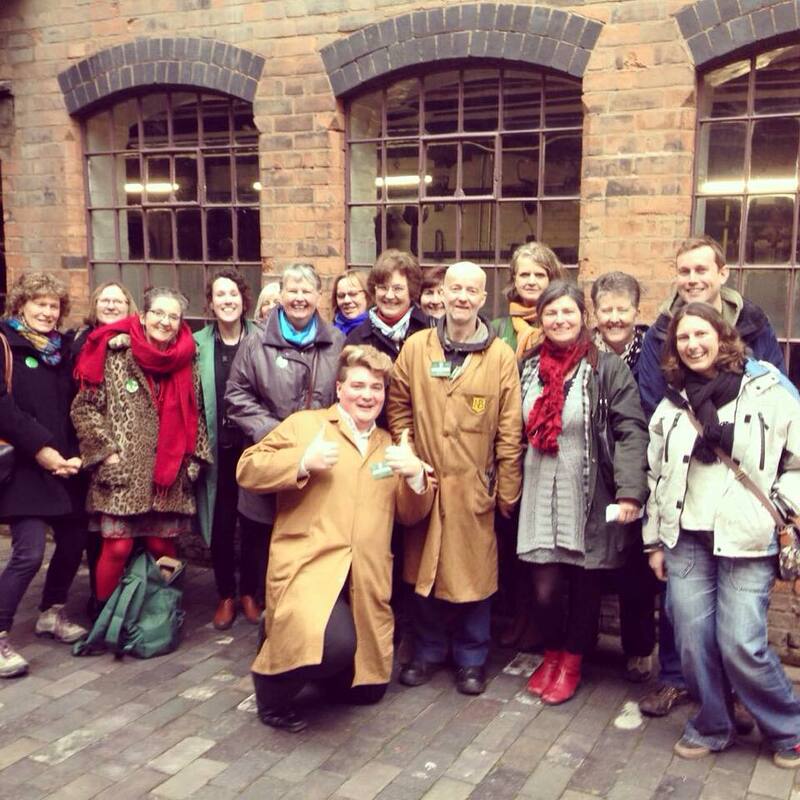 Soon after, they arranged for Civic Society members to visit the Coffin Works. It was just prior to the restoration work starting and the building was completely empty and there was no power. Buckets were everywhere to collect the snow that was coming through the holes in the roof, but I was hooked. I wanted to play a part in bringing the factory back to life. As the work progressed I often took the opportunity to go on site tours, so much so that Simon probably thought that I was stalking him! Seeing the beautiful new metal gates to the courtyard for the first time gave me a little lump in my throat and my heart still skips every time I walk through. All the workers remember it as being a happy place to work. It makes me happy now. Taking early retirement in December 2013 gave me time to enjoy new interests and I was thrilled to sign up to be a tour guide and one of the FoH team, and to be involved well before we opened at the end of October 2014. 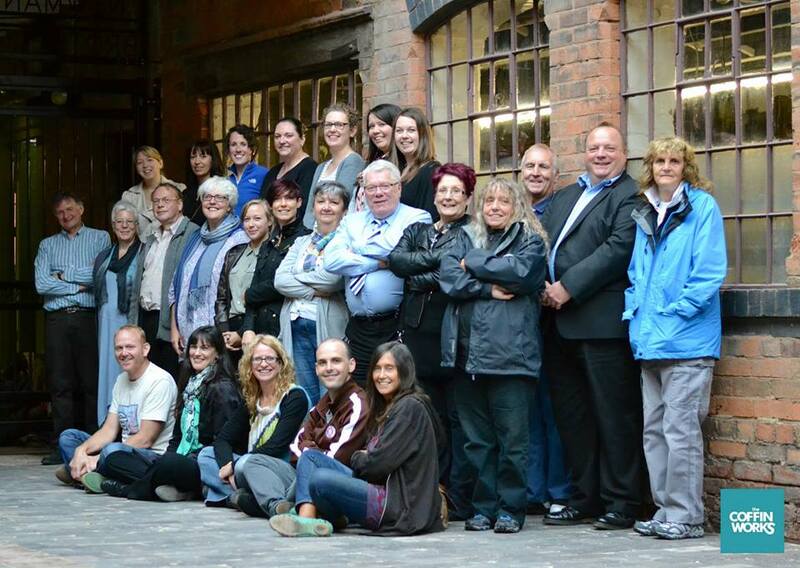 All the volunteers are as passionate about wanting the Coffin Works to become a successful visitor attraction as are Simon, Suzanne, Sarah and Lorraine and it’s such a great team to be part of. Just some of the volunteers at Newman Brothers. Here we are re-creating a historic photo of previous workers who stood in the same place for their photo in 1912. I love hearing stories from other tour guides, some of which I quite shamelessly include in my tours. There’s David B, the retired funeral director and Neville, who’s first job was as a carpenter at a funeral parlour that bought fittings from Newman Bros. Then there’s Tim, who actually knew the last owner, Miss Joyce Green, because Tim was the chap at Advantage West Midlands that bought the building from her, and often joined her for tea on Friday afternoons. How fantastic is that! But I couldn’t do my tours without help from the brilliant Cornelious, who’s always worked ‘in the trade’ and who now demonstrates the drop stamps and fly presses in the Stamp Shop and who really brings to life what it would have been like to work there. Why I love to volunteer one one of my most memorable tours so far! I love sharing the stories of the building, the workers and the industry that ‘died’ with visitors and I love it when visitors share their memories and knowledge. My favourite tours have been with visitors that start as strangers but come together as a group as they all share their stories. I’m continually learning from our visitors and I’ve become fascinated by coffins and burials. And I’m still fascinated by shrouds. Christine Cushing, volunteer tour guide.